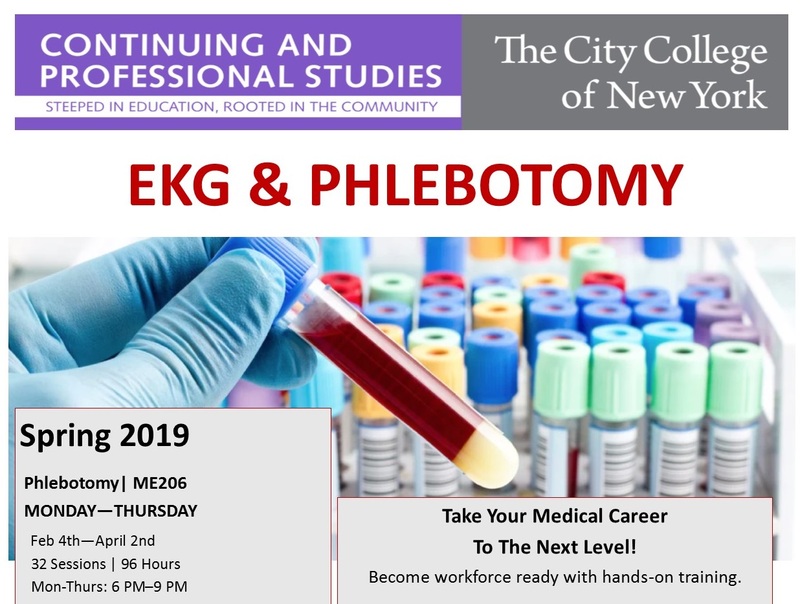 New course offerings from Continuing and Professional Studies at CCNY include Phlebotomy. Continuing and Professional Studies at CCNY is introducing new, career-enhancing classes this Spring 2019 semester. An Introduction: Phase I Environmental Site Assessment for Commercial Real Estate at CCNY, ASTM International's flagship training course, will take place from April 23-24. It is aimed at environmental professionals who are already active in the industry and wish to be up to date in the application of standards-related expertise. Certified Nursing Assistant (CNA), a 130-hour program, is approved by New York State and provides both classroom instruction and a 30-hour clinical internship. Coursework includes anatomy and physiology, basic life support, and fundamentals of patient care. During the final six weeks of class, students are assigned to a clinical externship in a nursing home. Starting March 9. Phlebotomy is a 96-hour program perfect for CNAs and other patient care professionals who want to become Certified Patient Care Technicians (PCT). Students will learn how to draw blood from patients or donors and assemble equipment (such as needles, blood collection devices, gauze, tourniquet, cotton, and alcohol). Starts Feb. 4. Students interested in becoming Pharmacy Technicians can enroll in a 75-hour certificate program that prepares students to follow a rewarding career path in the industry. Topics covered include, Pharmacy Law, Human Anatomy and Physiology, Medical Terminology and Pharmacology. (Prior knowledge of arithmetic and pre-algebra required to prepare and dispense drugs.) Students learn about serving patients, maintaining medication inventory control systems, and managing a pharmacy. Classes start Feb. 9. The Medical Interpreter Certificate program is a 102-hour course is designed to train entry-level medical interpreters in English/Spanish to meet the needs of doctors’ offices, hospitals, emergency rooms, and other medical facilities. Many hospitals now rely on telephone interpreters to assist patients. CCNY’s Certificate in Medical Interpreting is the only one of its kind to incorporate Telephonic Interpreting as part of its curriculum. Students also receive targeted assistance with resume writing, interview skills, and career development. Course begins Feb. 11. Please call 212-650-7312 or email the office for more information on starting dates and times, as well as for details about registration and fees. Interested students can browse courses here.